While Grant's Tomb had been as often-visited tourist attraction until the years following World War II, by the 1970s, visitors rarely made it to this out-of-the-way city landmark. Instead, it was increasingly a site of gang fights and vandalism. As the one-hundred year anniversary of Grant's death approached, the National Parks Service, owner of Grant's Tomb and the surrounding area, decided to revitalize the site with the creation of a public sculpture. They hired sculptor Pedro Silva to design and build the work in conjunction with members of the neighboring communities. City Arts, an organization that creates community-based art projects, was enlisted to oversee the work. 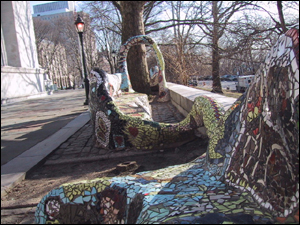 The resulting piece is a brightly colored, undulating bench that moves around the east, north, and west sides of Grant's Tomb. 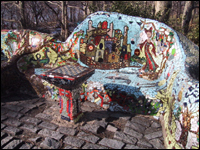 The images on the bench range from historical depictions of Grant's life, to fanciful, imaginary scenes of castles and dragons, to more contemporary subject matter such as cars. The bench's irregular contour often seems to be designed to accommodate the images in the work as well as elements of the environment such as trees and distant views. The rounded edges, the color, and the flow of the bench contrasts with the white, straight edges of the monument that it surrounds. While some people have applauded this contrast in styles, others have contested the placement of the bench, and have fought to have it removed. Those who have spoken out strongly against the bench include members of historical and preservation societies, as well as Grant's descendents. Relationship between art and the architecture that surrounds it. Peace Fountain at St. John's the Divine. Many of the sculptures in this space were made by children and set in bronze. It is an example of community involvement in the creation of a public space. General William Tecumseh Sherman. This sculpture was originally intended to be placed at Grant's Tomb, but Grant's relatives were opposed to the placement, thinking that it would draw attention from the building.